We are a member of The Lutheran Church-Missouri Synod (LC-MS). 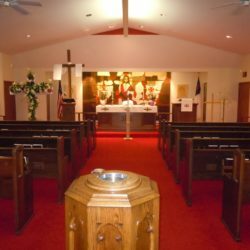 We are a confessional Lutheran church situated in the beautiful Northwoods of Wisconsin. Come up for a vacation and join us for worship! We don’t provide a “product”, per se. What we do provide is the blessed gift of the forgiveness of sins by the “means of grace” for the repentant. Those means are God’s Word, Baptism, Absolution and the Lord’s Supper. Divine Service Sundays at 9:30 a.m., followed by Fellowship. The Lord’s Supper is offered on the 1st, 3rd and 5th Sundays. It’s a matter of death and life. Love like that blows us away. It can only come from the Son of God. It’s a love mightier than all the mess we’ve made of our lives, and stronger even than death itself. Join us this week as we gather one more time to hear and ponder, to proclaim and sing and celebrate the most remarkable week in human history. It really is a matter of death and life. We believe that the Holy Bible is the inspired and inerrant Word of God, and the only source and norm for Christian doctrine and practice. We believe that there is only one true God, who has revealed Himself in Three Persons: Father, Son, and Holy Spirit. We believe that, by His innocent suffering and death on the cross in our place, Jesus Christ made full atonement for our sins. We believe that Jesus rose from the dead on Easter morning, later ascended into heaven where He now lives and reigns to all eternity. We believe that Jesus will return on the last day to judge the living and the dead and take all believers in Him to eternal life and glory. We believe that God comes to us in His Church through chosen means of grace which are the Word of God (The Holy Scriptures) and the Sacraments of Baptism and The Lord’s Supper (Holy Communion), and that through these means of grace He conveys to us His forgiveness. We believe that we are saved only by the grace of God through faith in Jesus Christ, which is a free gift of The Holy Spirit to us. We believe that in Holy Baptism by the Word of God in and with the water, along with faith which trusts this word of God in the water brings all people including infants into God’s Kingdom, so that we might be heirs and members of the Body of Christ as we receive the Holy Spirit, who works faith in our hearts. We believe that the Sacrament of Holy Communion is the true body and blood of Christ which is received with the mouth along with the bread and the wine (Real Presence). This is not a symbolic eating and drinking. We believe that those who receive this Sacrament actually eat and drink the body and blood of our Lord and Savior shed for us on the cross. We do not understand or try to explain this. It is a mystery. We therefore, celebrate “Closed” Communion and ask that those who have not been confirmed in the Lutheran Church refrain from communion until they have been properly taught about the sacrament. The practice of Closed Communion sounds so foreign in today’s world of tolerance and acceptance but to not practice Closed Communion would be to show our callous disregard for you. We practice Closed Communion out of love for you so that you do not eat and drink to your judgment for there are indeed significant differences. To read our Close Communion practice we encourage you to go to the tab on Closed Communion to see some wonderful resources on Closed Communion. Our God Speaks and we listen. He acts and we react. How mighty and majestic is the God who not only created us but bought for us a place in heaven. This is our gracious giver God. We do not worship a stone idol, a graven image. We worship Jesus Christ: True God and true man, redeemer of all humanity. This redemption, this salvation is a wondrous event. It pulls us toward him. It draws us to his house. It empowers us to sing praises to his name. Even as we join together to publicly worship him, he strengthens our faith. He makes us better, more loving people. He actually builds us up so that we can be a little more like him each time we immerse ourselves in his Word and Sacraments. This is worship, or at least it’s a way to verbally express something that is ultimately inexpressible. If prayer could be seen, what would it look like? Well, no one really knows the answer to that one, but when you attend a Lutheran church, you may see many symbols and colors used in worship. You may also hear language that might seem strange. All of this is done to make worship a more concrete, more tangible experience. We try to give expression to a God that is beyond our vocabulary. A cross reminds us that Jesus died on a cross to pay for our sins, but the cross is empty and that reminds us that Christ was victorious in death, rose from the dead and now sits with the Father in heaven. There are really too many visual elements in worship to explain all of them here, but all of them are used to give poetic expression to our prayer. In this poetry of word, movement, symbol and color, we make our best attempt to express our gratitude to God for eternal life. What is a hymn anyway? A hymn is a song that praises God. This could accommodate a very large range of music. Martin Luther once said, “I place music next to theology and give it the highest praise.” Partly due to this deep theological view of music and partly due to Germanic heritage, Lutherans have historically used more challenging music in worship. You may find some of the hymns hard to sing or even hard to understand. That’s all right, some life-long Lutherans have the same challenge. But remember that this activity of worship is directed toward God. While it may take us some time, patience and effort, we want to offer our very best to God. Some of our hymns are most definitely meat and not milk, but seldom will one find a more beautiful collection of worshipful psalmody and poetry than one finds in a Lutheran hymnal. You will find that worship in a Missouri-Synod Lutheran Church centers around two things: Word and Sacrament. The Word of God, that is the Holy Bible, is the most central thing in our lives. This is how we learn of our salvation that was won for us by Jesus Christ on the cross. But our Lord is not just some god about whom we speak, he is the living God who comes into us through the hearing of his Word and through participation in his Sacraments (Baptism and the Lord’s Supper). We believe that through this Word and Sacrament, God actually enters into us via the Holy Spirit. He saves us, strengthens the faith of those he has saved, and empowers us to live a Christian life. Word and Sacrament are therefore the central points of both our worship and our lives. The Word of God carries two primary messages: Law and Gospel. Law is that which God expects from us. We see Law in things such as the Ten Commandments. We also see Law in the words of Christ when he commands us to love one another as God loves us. The Gospel is the good news message of the gifts God gives us. Of course, salvation is the greatest of all his gifts to us. Because Jesus Christ saved us from Hell by dying on the cross for our sins and being raised from the dead on the third day, we too shall live eternally with God. The Law is used primarily by the Christian so that we can see what God expects from us and thereby see how sinful we are. This way we see our need for salvation. The Gospel’s beautiful news of salvation for all mankind is truly seen by those who are first convicted by the Law. First, we recognize whose supper it is. It is the Lord’s Supper, not ours. So, we feel obligated to celebrate it the way he has commanded it to be celebrated. The Lord intended for people to celebrate his supper who believe they are truly receiving his body (the very body that hung on the cross) and his blood (the very blood that dripped from his side) for the forgiveness of their sins. We believe this even though it is beyond our understanding as to how such body and blood can be in, with and under bread and wine. What’s more, these people should be united in the same belief in Christ and his teachings. Therefore, we invite anyone who walks in doctrinal fellowship with the Missouri-Synod to join us in the Lord’s Supper. Unfortunately this has become such a foreign practice in the United States that most do not understand that this is practice of love for our fellow Christians. We therefore encourage you to see our tab on Closed Communion for many wonderful resources on this practice. However, there are other guidelines for those who are not fully united with us. We welcome all Christians to our worship. However, it is a consequence of the sad division of Christianity that we cannot extend an open invitation to join us at the Lord’s Supper. Lutherans believe that the Lord’s Supper is not only for the forgiveness of sin but also a sacred act in which the congregation celebrates a oneness in faith and teaching. Reception of the Lord’s Supper by a Christian not united with the Lutheran Church in faith and teaching would be implying a oneness which does not yet exist and thus would be giving a misleading witness to the world. However, we must all pray that such unity might one day exist according to our Lord’s good and gracious will. We also welcome non-Christians to our worship. Obviously, we cannot invite you to the Lord’s Supper since you do not share our faith in Christ. However, we do invite you to join us and hear God’s Holy Word so that you may learn how we have transgressed his law, deserve nothing but death and his condemnation, and yet despite this depravity you will hear how Jesus Christ died so that you too can have eternal life. Please feel free to speak to the pastor if you have any questions about our Christian faith. Divine Service at 9:30 a.m. followed by Fellowship. We are a member of The Lutheran Church-Missouri Synod (LC-MS). 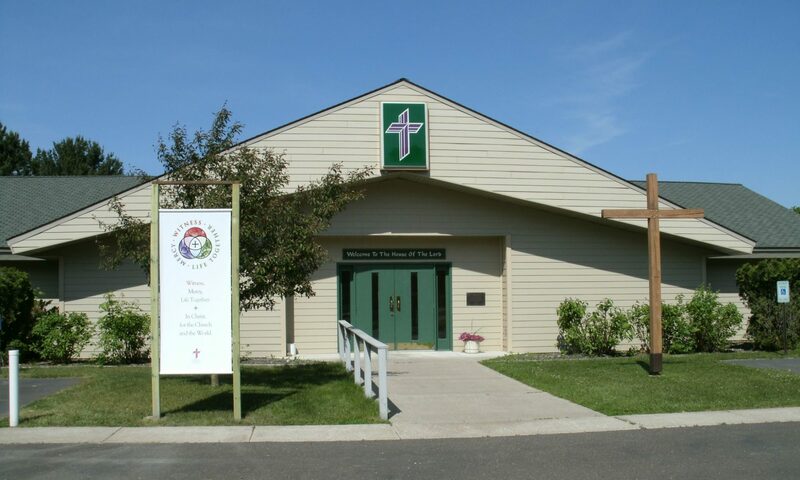 We are a confessional Lutheran church situated in the beautiful Northwoods of Wisconsin. Come up for a vacation and join us for worship!